Canadian Prime Minister Justin Trudeau met his Indian counterpart, Narendra Modi, on Friday. The meeting came towards the end of Mr Trudeau's first official visit to India, which has been far from smooth. Both countries have denied speculation that the Canadian PM has received a lukewarm reception in India. Mr Modi has, on many occasions, personally received visiting government leaders at the airport. But he welcomed Mr Trudeau on Twitter, a day before the two were scheduled to meet. The leaders finally met six days after Mr Trudeau arrived in India, and signed a raft of agreements reiterating Indo-Canadian ties. Mr Trudeau's trip has been marred by criticism that his government is soft on Sikh extremists. He said the Delhi dinner invite sent to Jaspal Atwal, who was convicted and later acquitted of trying to assassinate an Indian minister in 1986, was a mistake. The dinner, which was hosted at the Canadian High Commission on Thursday night, then drew attention for another reason - Mr Trudeau arrived doing Bhangra, a popular Indian dance that he is known to like. The crowd cheered him on but Twitter he had a mixed reaction, with lots of Indians and Canadians seeming to disapprove of the display. 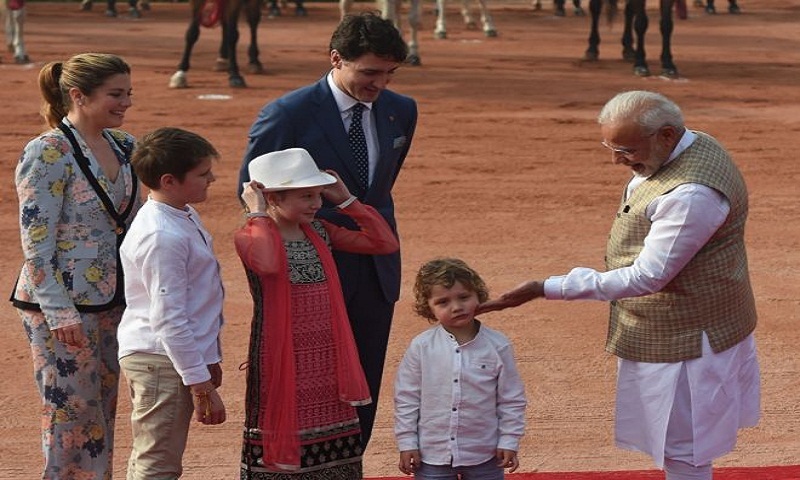 Mr Trudeau and his family have also been in the news for wearing traditional Indian outfits several times on their trip - a decision that has amused some Indians and annoyed others. Many tweeted to say that Indians do no dress up like people in Bollywood films. Mr Modi received him at the Rashtrapati Bhavan, the presidential palace, in Delhi. They met again later on Friday, along with other delegates, to discuss trade, defence, climate change and co-operation over civil nuclear energy.